Get notified when FC Barcelona tickets are available! FC Barcelona, or Futbol Club Barcelona, is a professional football club from Barcelona, Catalonia, Spain. It was founded by a group of English, Swiss and Catalan football players in 1899 and has since earned a place as a symbol of Catalan culture. 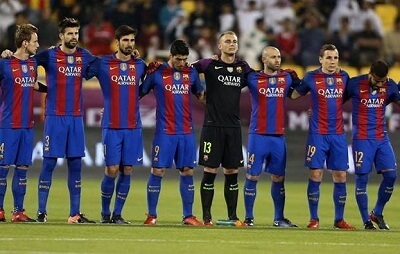 The FC Barcelona is owned and operated by its supporters, and it is the second most valuable sports team on the planet. FC Barcelona’s players have a record as having the most Ballon d’Or awards as well as the most FIFA World Player of the Year awards. Get your FC Barcelona tickets to their next game now.